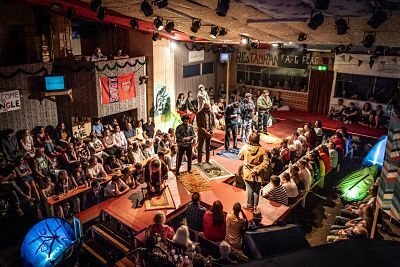 The Jungle, which has transferred from The Young Vic to the West End, immerses its London audience in the middle of the refugee encampment which was built up near Calais from 2015 to 2016. Playwrights Joe Murphy and Joe Robertson created the Good Chance Theatre in The Jungle in 2015, offering entertainment, music and workshops for the residents of the camp, which at its height numbered over 8,000. Rather than focusing on the activities on their theatre, the playwrights have written a fictionalised account of the founding of the camp by a few enterprising refugees from Afghanistan, Syria and Sudan, amongst other countries, and its demise a year later by French police with bulldozers. In between, a handful of well- meaning British people arrive, ranging from fresh out of Eton Sam to friendly alcoholic Boxer. The playwrights wisely do not centre the story on them but instead have Safi, a Syrian migrant and English literature major, act as narrator. 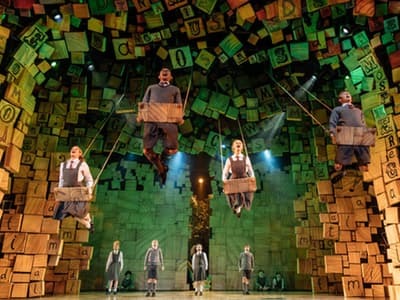 The Playhouse Theatre is completely transformed with audience members sitting on wooden benches (thankfully with throw cushions) around the action. On one side is Salar’s Afghan Café and the tables that some of the audience sit at double as walkways for the actors. Televisions dotted around the place play Bollywood Films. Delicious smells emanate from the kitchen, cast members offer round sweet chai and fresh bread. As the play begins, its starts at the end: the French authorities have ordered a “soft eviction” of the camp, saying the environment is unsafe. They have offered only 1500 homes around France, most of which will go to women and children. Meantime, a boy has been killed on the motorway, trying to get a “Good Chance” by smuggling himself into the UK in a lorry. The police arrive with tear gas and the makeshift city is destroyed. The play then starts somewhere at the beginning, telling different story strands while still trying to move the whole cohesively forward as the refugees deal not only with their own dire situation but with the arrival of white British people who have decided to organise them. Young Sam plans to map out the city and build houses. Eighteen year old Beth starts a school and teaches English. Boxer is good at mending and building, while Paula looks after the children, many of whom are unaccompanied. It’s never clear exactly what Derek does other than bark orders and break up fights. Many of the young men are technically children but are looked after by the older men, such as fifteen year old Norullah, a cheerful trouble maker who works in Salar’s café and has become like a son to him. We hear the devastating story of Okot who escaped from Sudan only to be tortured in Libya as his captors demanded more money from his mother. Beth makes it her mission to help him get to the UK with the help of Kurdish smuggler Ali. Crises small and large occur but, as Safi says, there is hope as well: the Muslims gather to pray together, no matter what their sect, Omid happily plays his guitar which he smuggled from Iran, everyone is learning English and every now and again there is good news from someone who has made it to the UK. Everyone has a mobile phone which they check constantly, searching for news from home and finding entertaining relief from their boredom of being in this limbo. We are reminded of how the British people can leave at any time when Sam suggests that he and Beth go to a hotel for night - just as friends of course – as they having been living in squalor for months and need a break. When Beth goes to rescue Okot from the police station, she takes both him and Safi to a hotel just to clean up the teenager who has been beaten by the police and needs a rest. It is illegal for refugees to be taken to a hotel as they have no passports, but Beth risks it anyway. 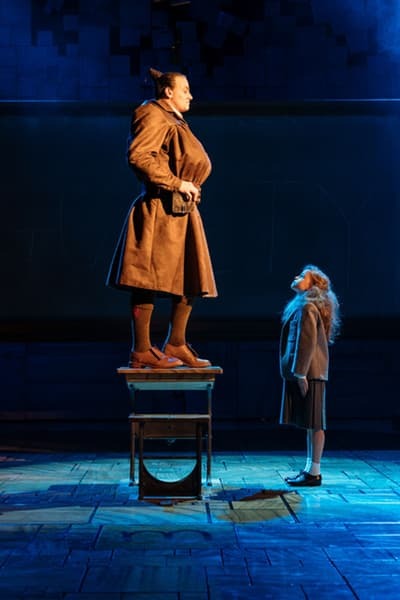 Although the play is happy to laugh at the sometimes misguided good intentions of the British, it is clear that they are there because their country is doing little for the refugees and they feel a need to help. Paula, most likely modelled on real life volunteer Liz Clegg, is the most effective in her clear intention to help the children. Sam takes on more than he can chew but although he comes from a privileged background, probably much like the Oxford educated playwrights, his heart is usually in the right place and he just wants to make a difference, as does Beth. The scene where she teaches the boys English by having them describe how they try to hide out in lorries is entertaining yet also drives home the point of how desperate and determined the migrants are. There are outstanding performances that hold the play together and bring it authenticity. Chief among them is Ammar Haj Ahmad, a Syrian actor, who plays the kind hearted Safi. It is clear he will have a major career after this production and has already made a mark on the UK theatre scene. John Pfumojena, a Zimbabwean born actor, is brilliant as Okot. His monologue describing his perilous journey to Calais through which he says he “died many times” is delivered absolutely straight which makes it all the more moving. Mr Pfumojena is also the musical director and composer for the production, clearly an artist to be reckoned with. 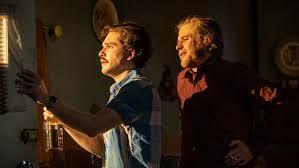 British-Iranian actor Ben Turner is excellent as the fiery but warm hearted Salar as is Mohammad Amiri as his young cheeky assistant Norullah. There is a nice mixture of trained, highly experienced British actors playing the migrants with performers who are actual refugees, such as singer Mohamad Sarrar and Kung Fu master Yasin Moradi. Amongst the British characters, Rachel Redford as Beth and Jo McInnes as Paula stand out. 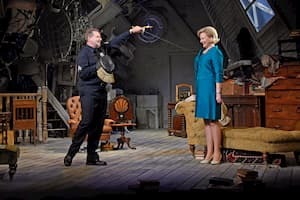 If I have one criticism it is that the play tries to do too much and may have benefited from telling the story from one person’s point of view. Although we do have sympathetic Safi at the centre, there is always lots of activity going on, actors running around and shouting in an attempt to depict the chaotic atmosphere of the camp, but it is sometimes too much. It seems petty to find fault when the creative team, directors Stephen Daldry and Justin Martin, along with the playwrights and the designer, Miriam Buether, have worked hard to recreate the experience of The Jungle to share with the world. This is an important play which poses questions with no easy answers. Did the British volunteers help or make a situation worse? When refugees could have claimed asylum in mainland Europe, was it right to encourage them to risk their lives trying to get to the UK? The camp has now been destroyed but migrants still gather in the thousands in Calais, trying to cross to England. Although there is not much hope at the end of this play, the playwrights are still running their Good Chance Theatre for refugees in France. 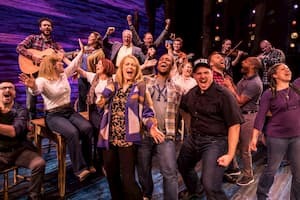 And hopefully audience members will feel moved after the performance to make a difference in their own way to help the refugee crisis by volunteering or donating.